REVOLUTION takes place this fall in the way Uncle Sam handles the mail. 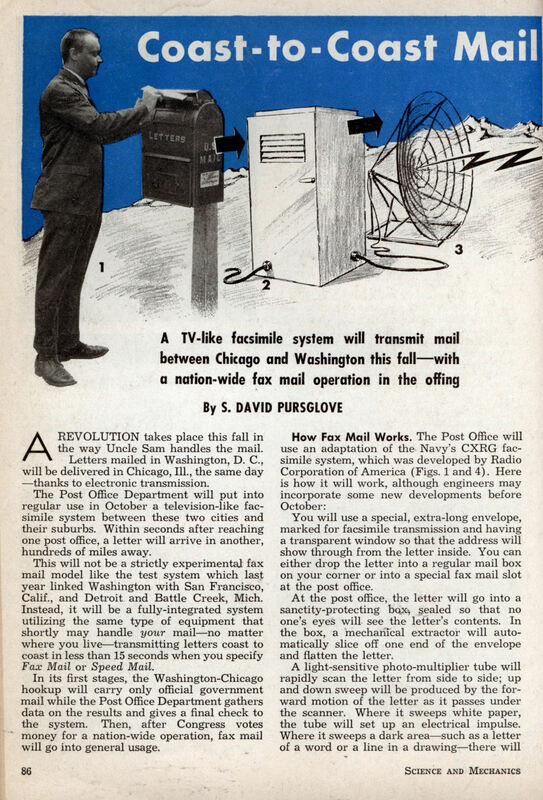 Letters mailed in Washington, D. C, will be delivered in Chicago, Ill., the same day â€”thanks to electronic transmission. The Post Office Department will put into regular use in October a television-like facsimile system between these two cities and their suburbs. Within seconds after reaching one post office, a letter will arrive in another, hundreds of miles away. This will not be a strictly experimental fax mail model like the test system which last year linked Washington with San Francisco, Calif., and Detroit and Battle Creek, Mich. Instead, it will be a fully-integrated system utilizing the same type of equipment that shortly may handle your mailâ€”no matter where you liveâ€”transmitting letters coast to coast in less than 15 seconds when you specify Fax Mail or Speed Mail. In its first stages, the Washington-Chicago hookup will carry only official government mail while the Post Office Department gathers data on the results and gives a final check to the system. Then, after Congress votes money for a nation-wide operation, fax mail will go into general usage. You will use a special, extra-long envelope, marked for facsimile transmission and having a transparent window so that the address will show through from the letter inside. You can either drop the letter into a regular mail box on your corner or into a special fax mail slot at the post office. At the post office, the letter will go into a sanctity-protecting box, sealed so that no one’s eyes will see the letter’s contents. In the box, a mechanical extractor will automatically slice off one end of the envelope and flatten the letter. A light-sensitive photo-multiplier tube will rapidly scan the letter from side to side; up and down sweep will be produced by the forward motion of the letter as it passes under the scanner. Where it sweeps white paper, the tube will set up an electrical impulse. Where it sweeps a dark areaâ€”such as a letter of a word or a line in a drawingâ€”there will be no electrical impulse. The total result will be a coded series of on and off impulses. These electrical impulses will be transmitted by microwave relay or coaxial cable to a receiving station in the destination city. (No special lines need to be built for fax mail; it will ride on a time-available basis on the existing commercial lines.) When commercial cables are busy, the mail will move by microwave. When microwave facilities are jammed, cables will be used. Some messages will travel part of the way by each. When both cable and microwave are filled with commercial business, the mail message impulses will be recorded on tape for later transmission. At the receiving station, the scanning process will be reversed. The electrical impulses there will become control voltages that will cause a small beam of light to flash on and off, corresponding to the light and dark areas in the original letter. This also will take place in a sealed sanctity box. “Ink” Is a Powder. Instead of a liquid ink, the fax mail printer will use a dry, finely powdered thermoplastic. It will be attracted to the charged areas of the selenium and will form powdered letters on the drum. The drum will then roll over ordinary typewriter bond paper and transfer the powdered letters to the paper sheets. These will be heated, the thermoplastic will melt slightly and the letters will fuse to the paper. Still in the sanctity-protecting box, the letter will automatically be folded and sealed in an envelope, its address again showing through a transparent window. It will then be ready for delivery to the addressee. How long will all this take? Not as long as it would take you to find a stamp in your cluttered desk drawerâ€”just eight seconds to transmit, fold, stuff and seal a standard-size sheet of stationery filled with writing or drawings. And the cost? This has not been determined yet. The Washington-Chicago hookup will help gather cost information on which to base fax mail rates, although the goal is believed to be the same as air mailâ€”7c. Helping to hold costs down will be the fact that fax mail eliminates much of the time-consuming work now necessary. Ended will be much of the handling that a letter gets in moving from the post office to the depot or airport, onto the train or plane, off again and on to another post office. Photographs cannot be sent very well, but the tests last year indicated that all types of letters can be sentâ€”typed, handwritten, in pen or pencil. However, second carbon copies, dark red ink and type smaller than elite type-writter size do not transmit well. Masterminding the operation for the Post Office is International Telephone and Telegraph Corp.’s Intelex Systems, Inc. IT&T proved the feasibility of fax mail and now is coordinating the various subcontractors who are installing the system to be opened in October. â€¢ To prove that fax mail is practicable. â€¢ To show the way to increased transmission speeds. â€¢ To test ways of preserving the privacy of first class mail. 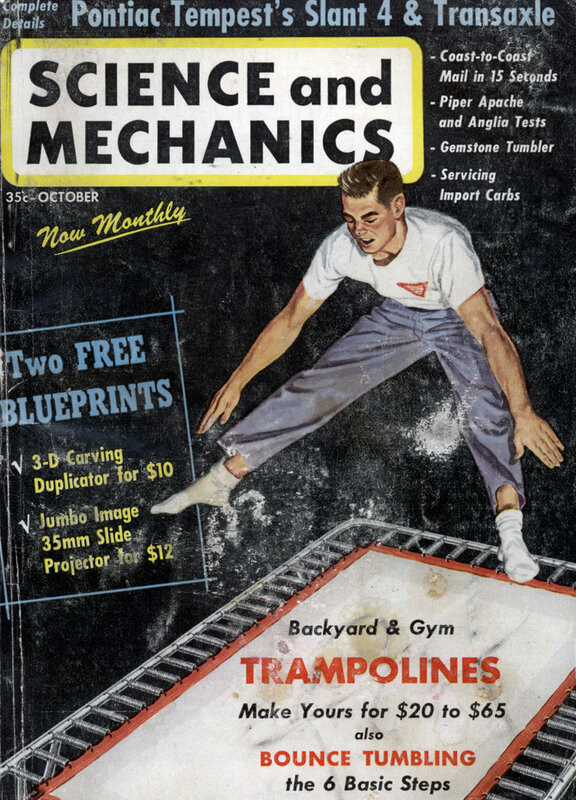 engineers have developed a speed control to gear transmission speed to the mail load. This uses an automatic electronic switch which will be pre-programmed on the basis of expected mail volume. High Speed Versus Low. There are advantages to both high speed and low speed transmission. With high speeds you get the obvious advantage of sending more mail in a given time period. However, when lines are not busyâ€”or when fax mail volume is lowâ€” slower transmission speeds will be used, which will provide greater clarity and higher resolution. The engineers’ knottiest problem was developing the closed box unit to preserve the mail’s secrecy. Some early consideration and research money went to X-ray type units to read the letter through the envelope when it was written with a special pencil or typewriter ribbon ink. This idea proved unworkable, and the researchers settled on the extra-long envelope to be used with the slicer and extractor. And, further to increase privacy, they decided to use a message scrambler to garble the electrical impulses being sent over the lines, with a second unit to unscramble them at the receiving station. â€¢ What is the status of legal documents sent by fax mail? Will the facsimile become the document, or will it be necessary to send the original on later by regular mail? â€¢ Who is responsible in case of garbled messages? â€¢ Can checks be cashed if sent by fax? Answers will be sought during the forth-coming final shakedown of the working fax mail system. Post Office officials, and many businessmen who will fax mail, believe new laws will be needed to cover these problems. Even before all the problems are solved for use of fax mail within the United States, serious thought is being given to international fax mail delivery. The system would use the same microwave frequencies used by TV, so there would be no interference by the ionosphere. The satellite (RCA already is working on several of these with the National Aeronautics and Space Administration) would be accurately positioned so that, with respect to any point on the earth, the satellite would effectively remain stationary. The Orbital Post Office would not be at the mercy of the weather or sunspotsâ€”as are conventional overseas communicationsâ€”and the band-width suggested for use is great enough to accommodate many more messages than can be handled by undersea cable. What’s amazing on this article is the degree of sophistication. They use a laser-printer for outputting the faxes and have a special “privacy” mechanism. Yeah, the basic system is pretty much the same, reading the white and black as 1-0/on-off is the basis of all computing. They even use the word and spelling of fax that is still in use 47 years later. The system us a bit unwieldy as described, the centralized service, undoubtedly due to the cost of a fax machine in those days. And I’m sure they figured out pretty quick that it was better to not worry so much about the privacy and just let people decide what to send. And no, you can’t cash faxed checks.